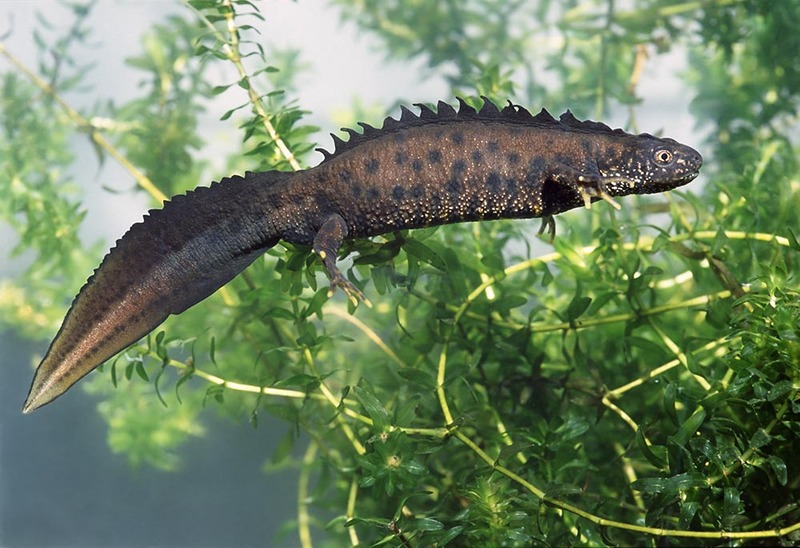 Great crested newts go into a period of dormancy between October and March with the females laying around 250 eggs between March and July wrapping each egg in a folded leaf underwater. It is estimated that there are about 75,000 populations in the UK, with a continuing decline of less than 5% between 1994 and 2006 (JNCC 2007) but being absent from both Northern Ireland and the Republic of Ireland. Following winter dormancy the newt breeding season starts immediately, adult great crested newts mature the eggs and sperm they will need for the next year in the previous summer and autumn. We all know what it is like after a deep sleep with food often being the first thought – no different for adult newts who may feed from the start of the breeding season in order to replenish reserves and this is further exasperated when they come out of the water after breeding and can travel up to 1km to look for food. Newts that have bred for at least one season may emerge from dormancy with their eggs and sperm ready for the new spring breeding season. Adult great crested newts normally begin moving from their hibernation land sites between February and April with a number of external factors determining this like temperature and rainfall. 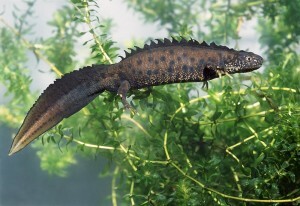 Typical nights that are normally wet or damp, with air temperatures above 4 – 5°C will see the emergence of the first newts who are clearly not fooled with the random British weather, where a single day that is reasonably warm for winter, only to then find themselves above ground or in the water when freezing conditions return. This makes it less likely that newts will be stimulated to emerge too early. Movement over land occurs almost exclusively at night and newts feed over a range of habitat types that support invertebrate prey. There is considerable variation between individuals in the amount of time spent in breeding ponds. The main period when breeding adults generally leave the pond is between late May and July. This movement occurs gradually, with most newts having left by August. A proportion however may stay on until October and even, in some ponds, over winter amongst pond sediment and debris. Emigration from the pond usually coincides with periods of rainfall, and there is evidence that newts may leave a pond at or around the same point they entered it, indicating that they return to favoured parts of the terrestrial habitat that they somehow recognise. After leaving the pond, newts generally seek underground crevices or concealed above ground refuges.